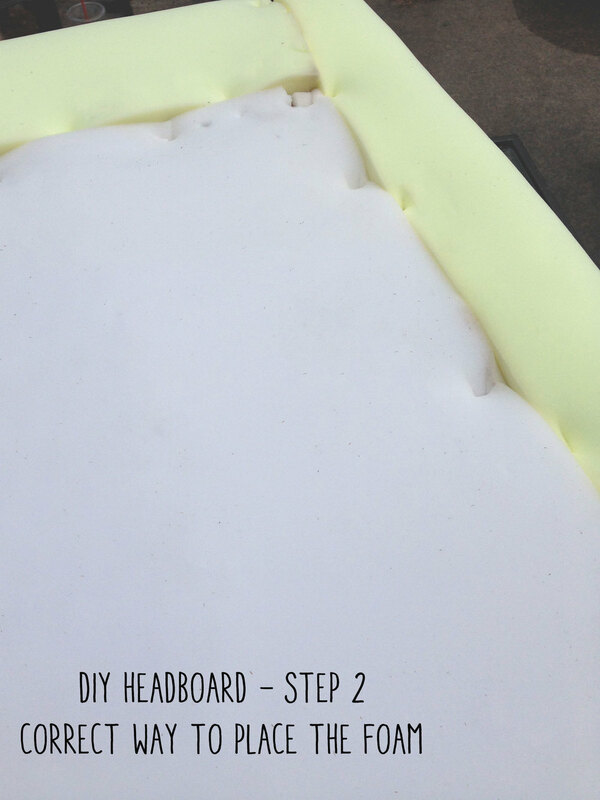 Pin now and make your own headboard! DIY Nail Trim Headboard for just $65.56! Throughout this process I learned a lot about how to avoid a minor (or in some cases, a major) breakdown. Fortunately for you, I took one for the team and learned the hard way about what to be aware of and what to avoid so you guys don’t have to worry about a thing, except well, actually making the headboard of course. Ok let's get started. First, you want to cut your plywood down to the size and shape of your choice. I made this headboard to fit a king sized bed so I cut my plywood to be 80” wide by 48” tall. To keep things classic and simple, I decided to go with a basic rectangular shape. Note: I have lots of experience using power tools from siding houses full time with my dad last summer (seriously, not joking! #girlboss) so I didn’t need assistance cutting the board but I highly suggest having someone around who knows what their way around a saw just in case you're not feelin' it. Once you have the plywood cut down to the desired shape and size, you’re ready to secure the foam mattress topper to one side of the plywood. Attention: Please be aware of how you're placing the foam topper on the plywood – I wasn’t paying much attention (or thinking clearly for that matter) and accidentally stapled the foam padding design side up – making for a very unattractive, bumpy finish once I got to stapling my fabric in place. To avoid a full out meltdown and an extra trip to the store to purchase a new mattress topper, be sure to place your foam padding DESIGN SIDE DOWN when securing it with your staple gun. Be sure to purchase a foam mattress pad that is large enough to fold over all sides of the plywood. This will ensure that you have nice, even and rounded edges when all is said and done. If you're making a king sized headboard, purchase two foam toppers because one will not be enough (trust me!). Now you're ready to get your fabric in place! 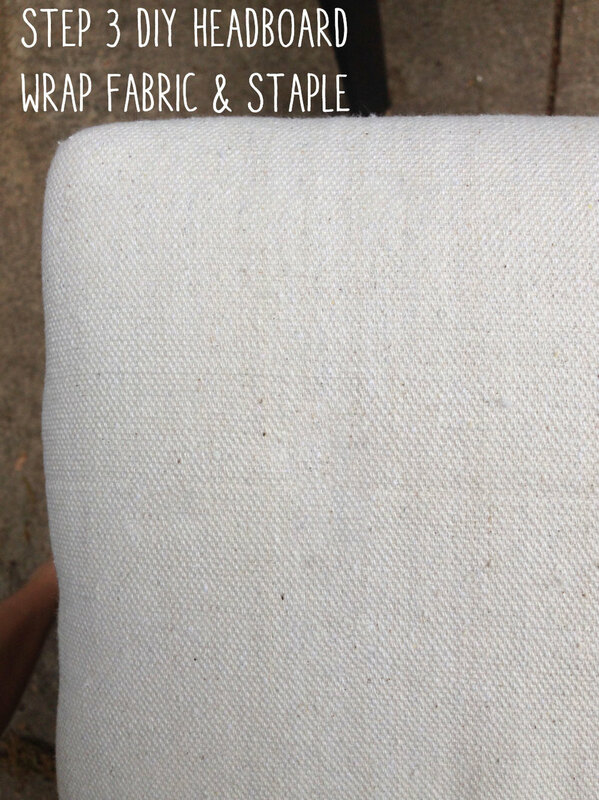 I wanted to go with a fabric that had a rustic yet industrial look and feel so I ended up purchasing a canvas drop cloth from my local home improvement store. If you’re a perfectionist, you might want to throw your piece of fabric in the wash/dryer for a cycle or two – this helps to loosen up the fabric, increase softness and reduce those creases/wrinkles from being wrapped up on a shelf or in a package. Take your piece of fabric and drape it over the padded plywood – take the scissors and cut off any excess fabric around the edges that exceeds about 3 ½ inches or so. Be sure not to trim the fabric too much, you want to be able to easily wrap the fabric around the edges of the padded plywood without getting that tugging/pulling effect when securing it with the staple gun. Now you're ready to staple away! Carefully staple the fabric along the backside of each edge. DIY Headboard - step 4, add decor. I wanted my DIY headboard to not be so obviously DIY, so when I came across this silver nail trim at my local craft store, I had to purchase it for this project because I knew it'd make it look a little more put together. I decided to go with wider spacing between each nail because I didn’t want the trim to take away from the simplicity look and feel I was going for – plus, I felt like it added to that industrial yet rustic look I was after. I placed my first nail 3” from the top and 3” from the side and nailed it in place. For each nail after that, I placed them 1 and 3/8th inches apart. Note: this process was way more tedious and time consuming than I had originally anticipated. If you want to go with the nail trim look too, I suggest purchasing nail trim by the yard (you might have to buy it online as I couldn’t find any at my local craft/fabric stores). This will save you a lot of time and will give you a cleaner and straighter border. If you do decide to go with the single nails, you might want to purchase a few extra packets for backup because a good 25% of my nails bent when I was hammering them in and couldn’t be used (and in case you’re wondering, yes, I had to make ANOTHER trip to the store for more). Note: I’m not sure if this is normal or not, but my drop cloth came as two different shades of canvas that had been stitched together (just my luck). No, going for a two-tone look was not my intention and yes, I had a minor breakdown. But! I think it's pretty cool and maybe I’ll start a trend? Like a his/hers side? #wishfulthinking?? Anyway, step five is to step back to admire your work and give yourself a huge pat on the back. You can now hang your masterpiece and show the world on instagram (or just your significant other) that you dominated this project! We'll be sharing the final look when we do the home/office tour next week! Stay tuned!